The automobile and tech industries are buzzing today, after the announcement of some exciting new concepts from Faraday Future–electric vehicle startup, and potential rival to Tesla Motors–at the 2016 Consumer Electronics Show. 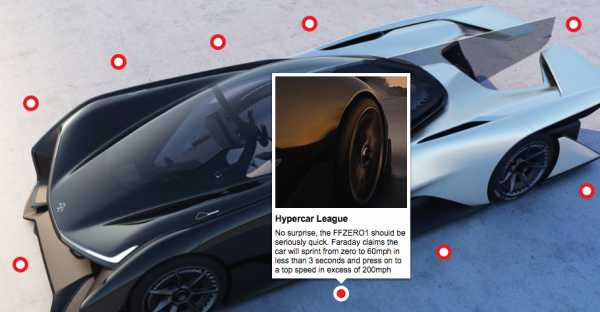 On Monday night, Faraday Future unveiled the FFZERO1, an all-electric vehicle with 1,000 horsepower. Obviously this will not be a road-ready vehicle for everyday purchase, and we will have to wait a little longer until we know more about Faraday’s first production car. But this was a fun look into a vehicle that most of us will only ever dream about. BBC Autos has given us an even closer look into the ins and outs of the vehicle, through the use of this clever interactive. Follow the link below to learn more, and keep checking the blog and DefensiveDriving.com’s social media for more updates from CES 2016.